This handmade silver pendant features an inspiring inscription about the strength of women. Bearing the inscription, Strong Women--May we know them, may we raise them, may we be them, this pendant is a token of inspiration for women everywhere. 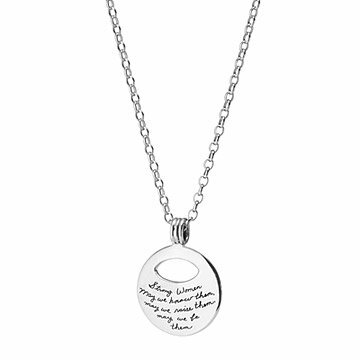 Handmade by BB Becker, each high-polished, sterling silver medallion features BB's wife, Jo's handwriting for a personal dimension to the engraving. It"s a thoughtful reminder of strength and empowerment for yourself or an influential woman in your life. Clean with a soft, clean, lint-free cloth. This is a beautiful necklace, but the message is too small. Consider making the disc and font larger. Readability is the only reason I gave 4 stars, instead of 5. Beautiful sentiment. Gave it as graduation gift and it was exactly what I wanted. I'd love to see it made a bit larger to be able to be easier read. Beautiful pendant. Gave it to my daughter for 1st Mother's Day. She lives it!